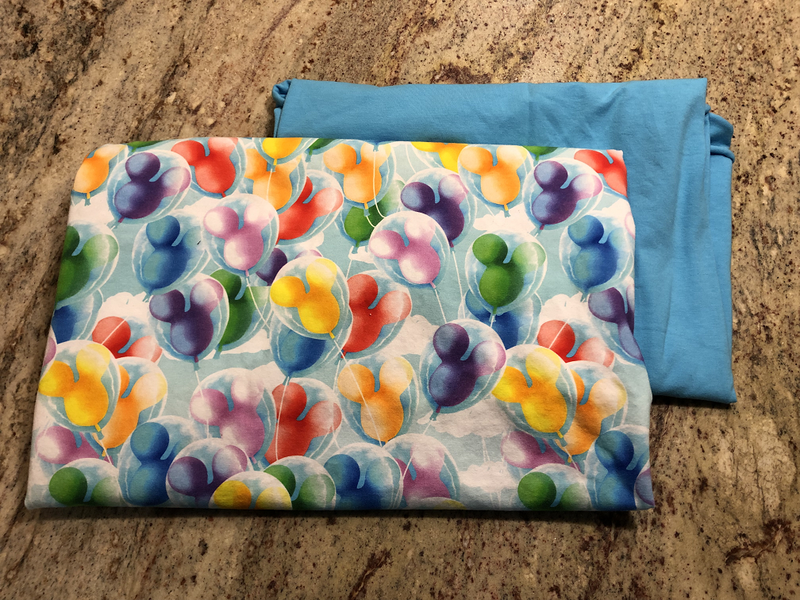 It'd been a while since I made something nice for my aspiring PA friend, but when she told me she and her family were taking a trip to Disney World, inspiration hit. 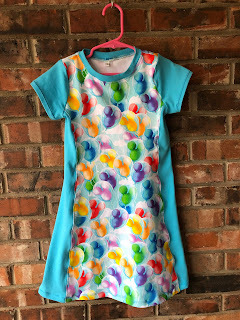 I'd recently seen a preorder for some "Happiest Place" Balloons - which I adored - and my friend's kiddo has a taste for classic A-line dresses. 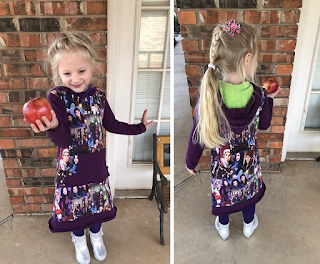 The Peek-a-Boo Patterns Violet is one of my go-to "quick makes," and I love the way it can simultaneously showcase, tone down, and conserve a colorful custom print. 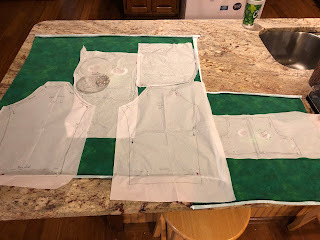 Now that I insist on topstitching, serging to close seams, and using a double needle on the collar and hems, I'll admit it's a little LESS fast than it used to be. 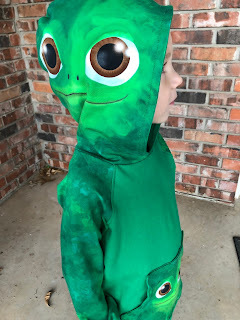 But it's still an easy make with a classic silhouette that I knew my friend and her daughter would love. And love it she did! She wore this the day she traveled out to Disney world, and I got pictures of her wearing showing it off at the resort. Sounds like a fun way to get excited for the trip, and a fun souvenir to bring home! 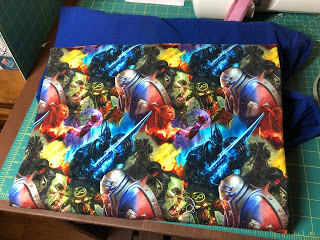 One of the challenges to custom fabric is that sometimes it takes a lot of *time* to find what you are looking for. 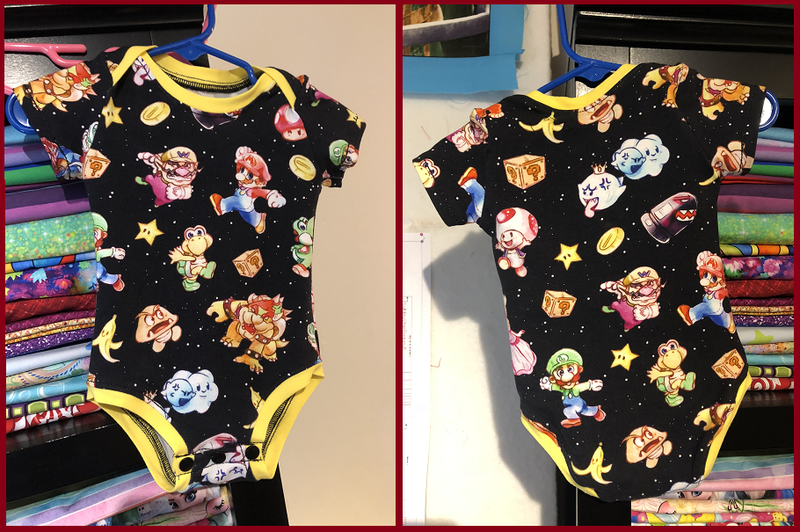 My local nephew - whose parents are both gamers - has scored some onesies from me using fabric from past projects. 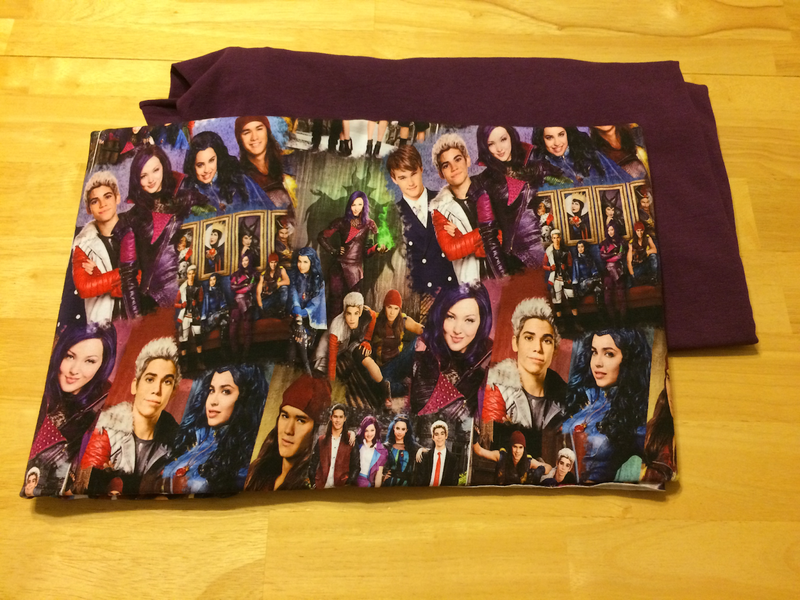 But when I saw this, I knew I had found THE perfect fabric for them, and not just an "acceptable" one. It was pure happenstance that I managed to score it during a day-after-Christmas sale, too. I'd already made the Brindille & Twig Baby Kimono once - and I hadn't been *that* thrilled with a pattern. But I shopped some of the other alternatives, decided this was still the cutest of the bunch, and what the heck, maybe a second go-round would naturally work some of the kinks out. This time, I modified the snap structure a bit: I made the tabs longer (lesson learned) & interfaced them for structure. This allowed me to anchor one of my snaps (upper right) to the tab directly without piercing the feature fabric. Kam snaps are pretty smooth, so I wasn't worried they would hurt baby. 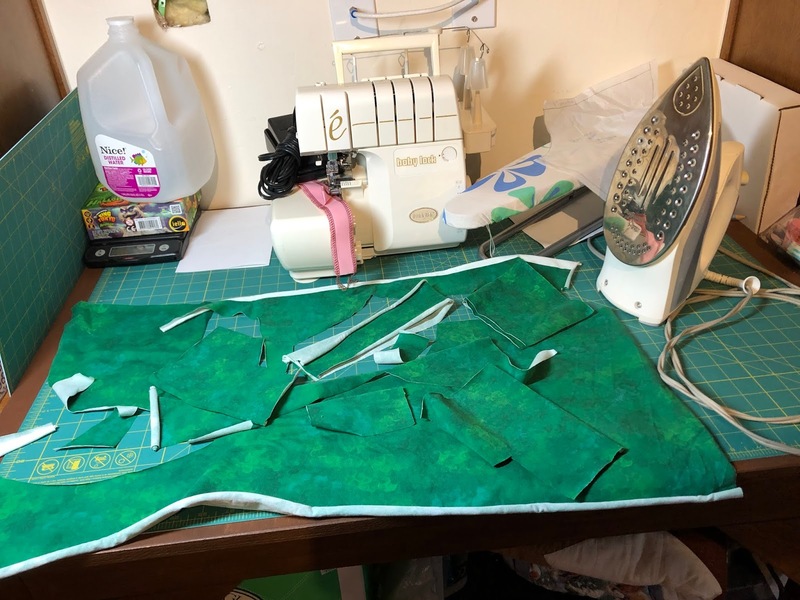 I also was a lot more careful to stretch the binding while sewing, add bulk when I turned the binding under (using my new serger), and use a longer stitch length straight out of the gate when top stitching the binding. 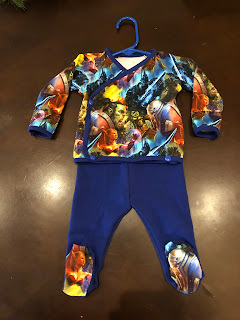 And of course, something *this* cute just needed matching pants. I decided to keep it simple (and cheap!) by making most of the pants out of the same (PurpleSeamstress) solid as the binding. 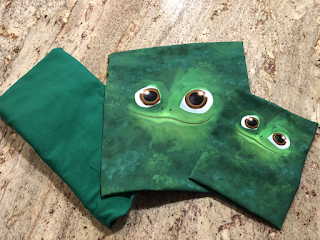 I changed the waistband construction to a traditional casing, and of course I couldn't resist adding Mom & Dad's favorite characters to the feet. Overall, I am pretty proud of this make! I'm still not crazy about B&T's construction methods, but I have made them work for me. 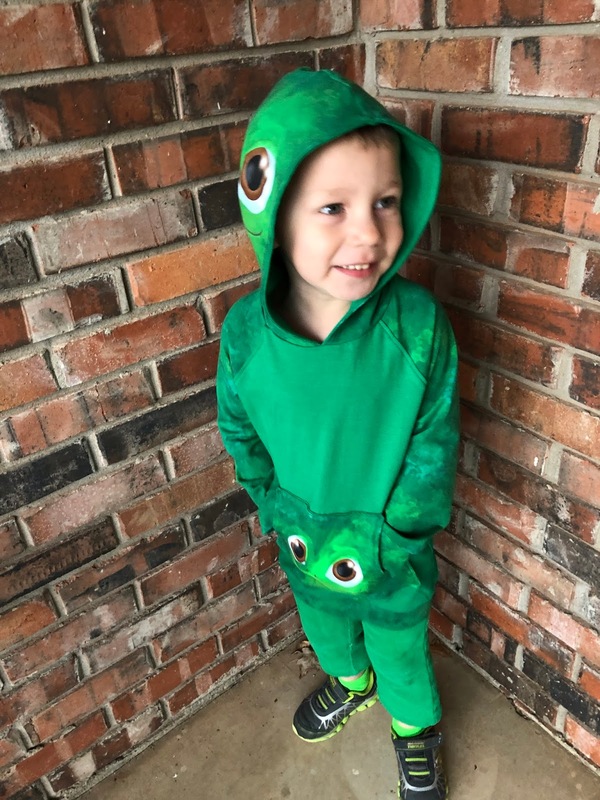 And you can't argue with the cuteness of the final product, which I suspect will be second only to the cuteness of my little nephew. 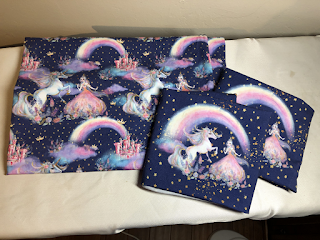 In January with my niece's birthday coming up, I had a great opportunity to conspire with her Grandma (My MIL) on a birthday gift. 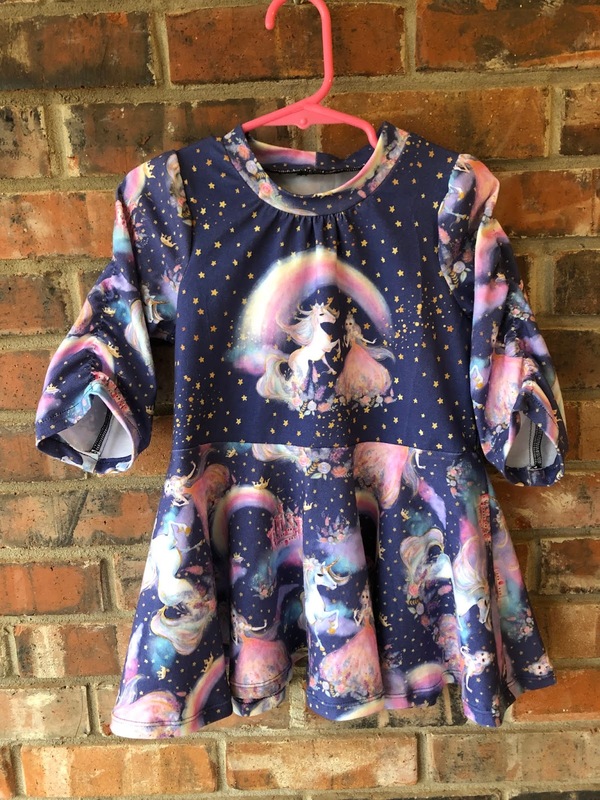 My niece is a consummate unicorn lover, and her grandmother knows her taste. 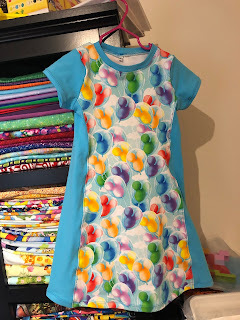 So this fabric - from Oh So Pretty Customs - was actually picked out by Grandma. 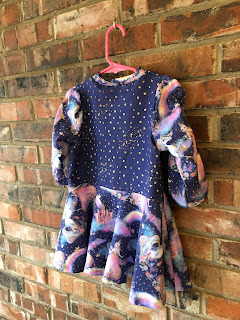 My niece is 11 - and preteens aren't a category I get to sew for much, these days. But my MIL knew her style and after a quick tour through all the girls' and women's patterns I owned, we settled on the CKC Esther. 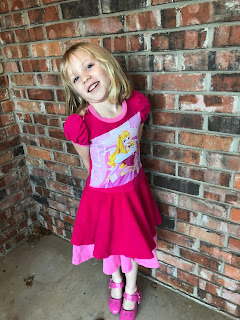 Grandma liked the shirred sleeves and the simple silhouette, and I liked that it was cute, feminine, and could be made with the quantity and cuts of fabric we'd bought. I used a standard panel for the front (and back!) 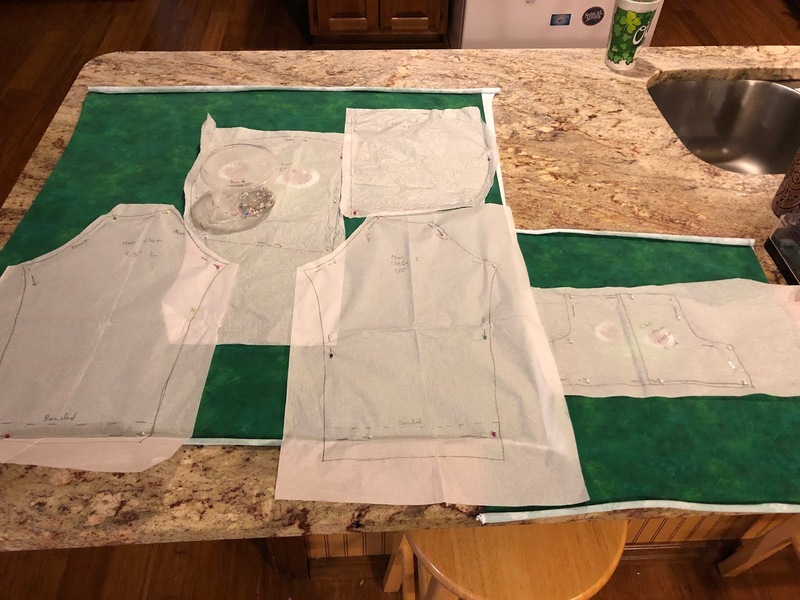 of the bodice, and small-scale yardage for the arms, neck band, and skirt. 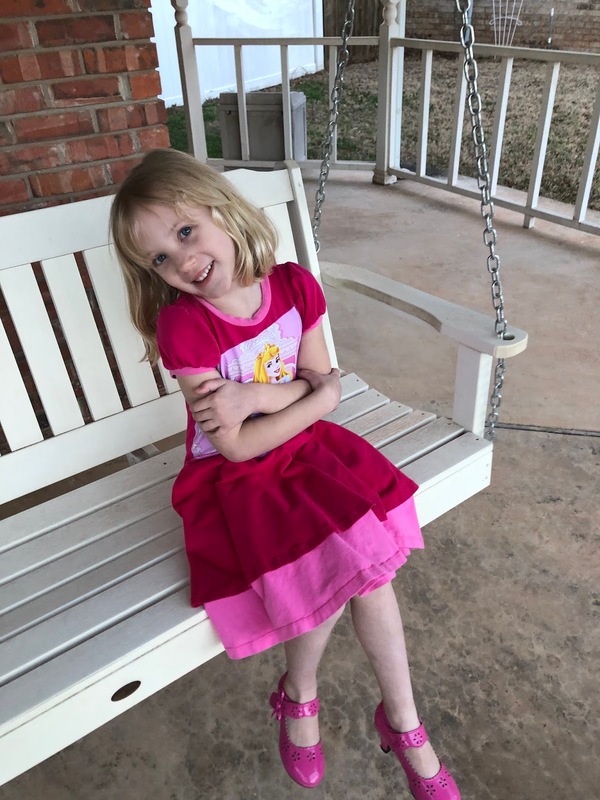 I'd hoped to have enough left over to make another Esther my daughter (who adores her cousin), but alas I'd underestimated how much fabric the top-length circle skirt would take when scaled up to size 8. This was also my first experience with shirring - CKC had a pretty helpful video, and for all the stressing I did, the shirring itself ended up being No Big Thing (assuming the garment holds up to multiple washes, that is). In retrospect, neck gathers + a panel was not the *wisest* combination, but I do think it worked out in the end. Well, except for one small thing - even with an extra 2" added, my niece's shirt *still* wasn't long enough when she tried it on. So, with her input, I added to the design. She selected the option of a second circle skirt in a solid color, and picked out a nice violet to complement the colors of the original design. And the result certainly brings a smile to her face! They say too many cooks spoil the broth, but I think this collaboration between three generations of RLQ women worked out pretty darn well. 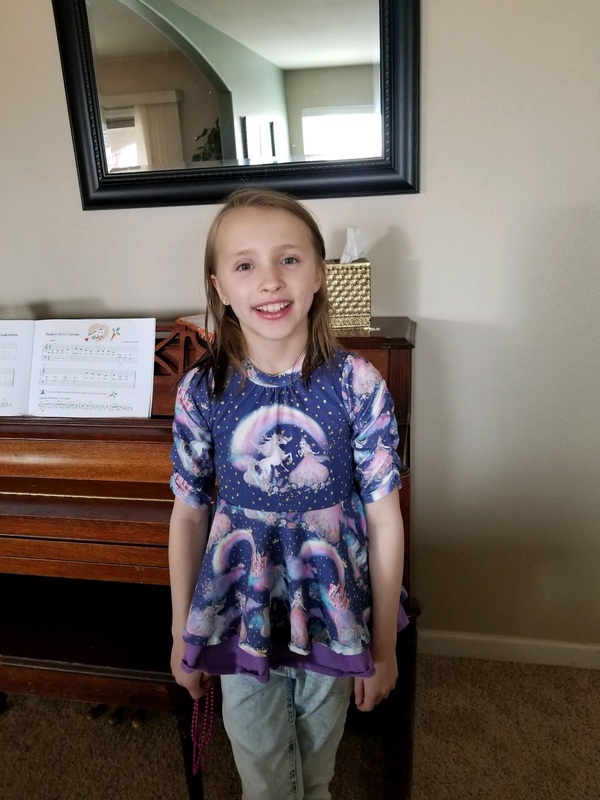 My niece is feeling good about her new shirt, I'm feeling pretty good about my first outing as seamstress for a preteen, and I think grandma is just proud of us both on a job well done. 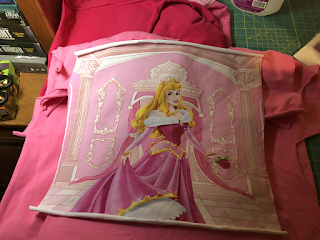 Last September, I idly added a Sleeping Beauty panel to a buy-sell-trade deal. The seller wasn't asking too much, and it was "flawed" but still useable, so it made sense to combine for a 2-panel deal. When the panel arrived, 2 things happened 1) my daughter fell in INSTANT love and 2) I laid it out next to several different pattern ideas I had, and realized the cut-off bottom was going to take a little bit of work to overcome. With Christmas coming, I set the panel aside for a bit. 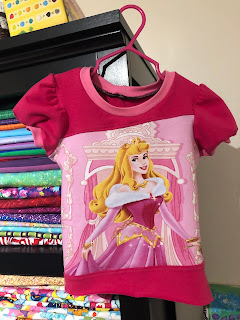 But then in January, when I made my daughter her much-anticipated Sleeping Beauty Dress out of the fabric we found at the Quilt Store using the VFT Ginger Pattern, her first response was "...where's the panel?" I took that as a hint that MAYBE I needed to dig this thing back out & make something with it. My first instinct was to try the off-the shoulder look of the Striped Swallow Desert Breeze, but then my daughter would have have two Aurora Dresses that were both off the shoulder and both best worn only in summer. 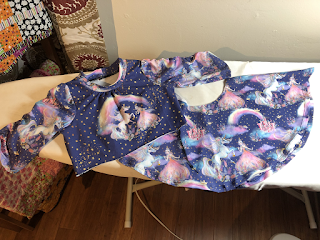 I also considered the SLPCo Adelyn (I'm still dying to make one) but ironically, the neckline was too deep to make a bodice out of without cutting off the top of Aurora's head. But then I noticed one of my favorite Custom Clothing makers, Chelsea over at Sew Stylin' Stitches, was going through a "puffed sleeve princess dress" phase at the time (link to order!). On a lark, I sketched out this colorblocked creation, and it was instant love from my daughter. 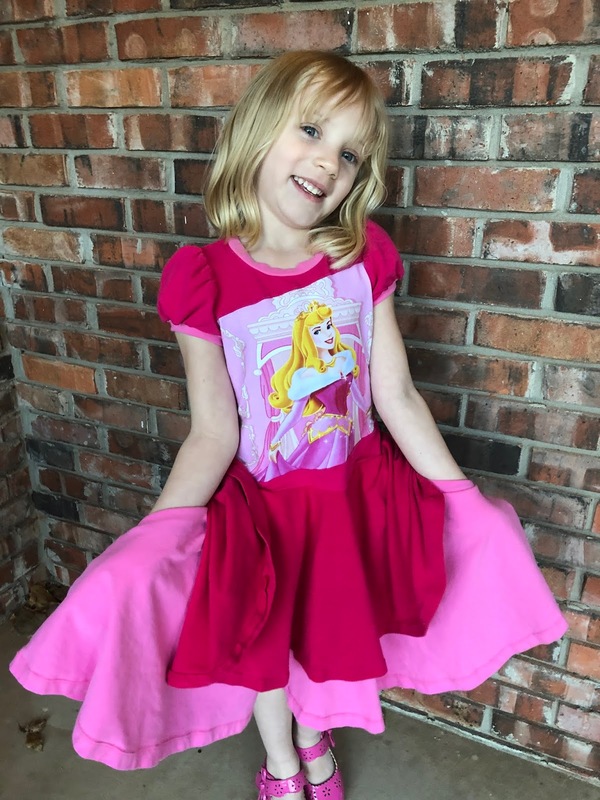 To create this look in practice, I used the Sew By Pattern Pieces Fun Tee, and added my own double skirt. 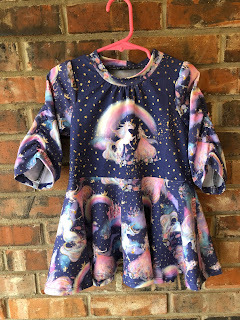 I didn't have high hopes for the SBPP pattern, because their Etsy store is small and on first blush it looked like most of their offerings are pretty nondescript. But let me tell you, I was *thrilled* with the actual content this pattern. 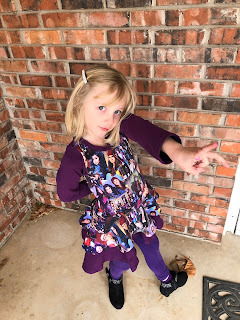 Despite being "just a tee shirt," the Girls' Fun Tee came with an A0 cutting guide, 36 pages of instructions (including line art drawings and links to helpful videos) and tons of tester photos. 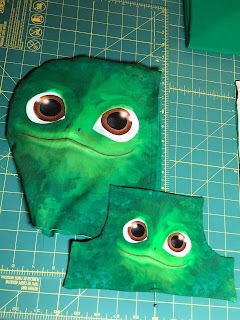 Heck, I even learned some things about reinforcing my shoulders and using my serger from this pattern! Gathered sleeves always take forever to make, and in this case I was also slowed up by the fact that I ran out of my Purple Seamstress Fuschia Partway through. Purple Seamstress usually has amazingly fast shipping, but the post office decided to celebrate MLK day by holding my package for an extra 3 days over the weekend. Also, Purple Seamstress' C/L is inexpensive but it isn't the most color-consistent from lot to lot, so it will forever annoy me how the fuchsia skirt doesn't *quite* match with the fuchsia top. Sigh. 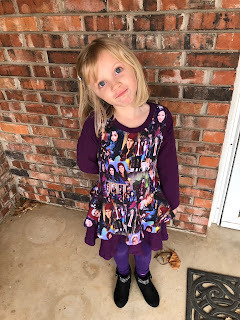 But the good news is, my daughter loves this dress! 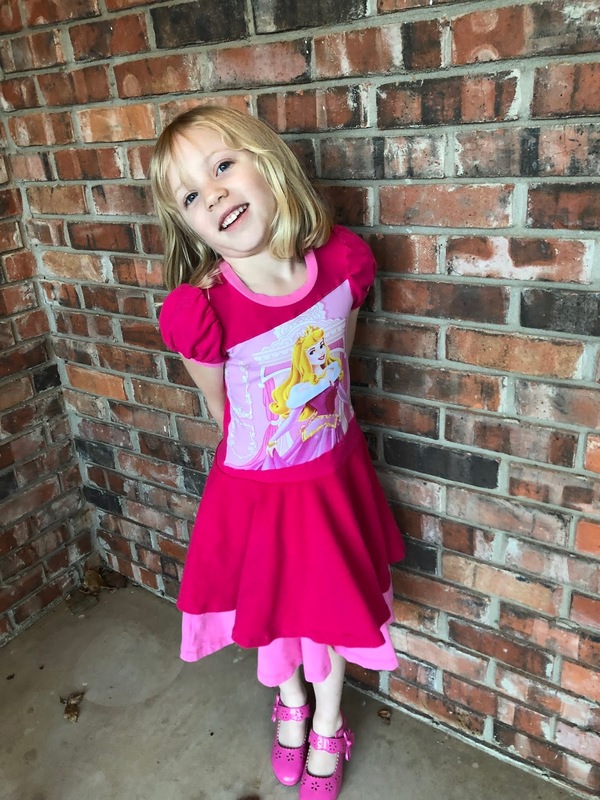 It twirls like a dream, it's got her favorite princess on it, it's got hidden pockets under skirt #1 (which I'd originally planned on making shorter until I saw it in person) and it's super comfy since it's all Cotton Lycra. My daughter says it is her "absolute favorite" dress, and out of her whole closet, this is the one she picked to accept an award at her school a few days after it was completed. I had to do a special load of laundry just for the occasion. But it was worth it, to see that smiling face so well dressed! 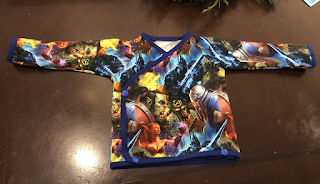 Both my son and I are still having fun with the Max & Meena Max Raglan... I gotta admit, I just love the silhouette of it. I was originally inspired to buy this fabric for my son in order to compliment a Rapunzel dress for my daughter, during my "I must make more sibling sets!" phase. 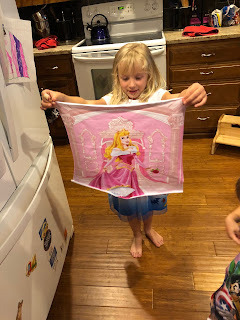 Of course, the Rapunzel fabric I got to go with it never really caught on with my daughter, and eventually I sold it secondhand to someone else whose kid was more enthusiastic. But, I couldn't *quite* give this fabric up. 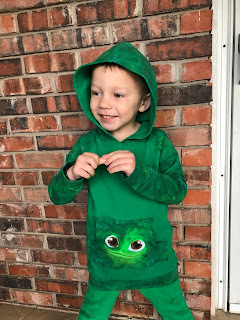 It was just too bright and fun, and my son does look excellent in green. Originally when buying I'd envisioned Pascal up front and a complementary smoky-green back; to save on money and fabric, I ordered a child panel for the front and an adult panel for the back. But then after my order was placed, someone posted post a really cute picture of a hood with Pascal on it, and I never *can* resist a good fussycutting challenge. 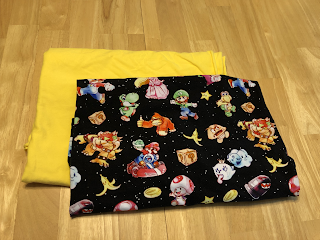 If I was going to use my featured fabric for the hood, I was also going to want to get the sleeves, the bands AND a new front pocket our of the same fabric. Which seemed... a little dicey to do without losing too terribly at fabric Jenga. So, as you can see above, I did a LOT of tracing and measuring beforehand. I did succeed, but I will tell you that out of 1,350 square inches of fabric, this is what I had left. 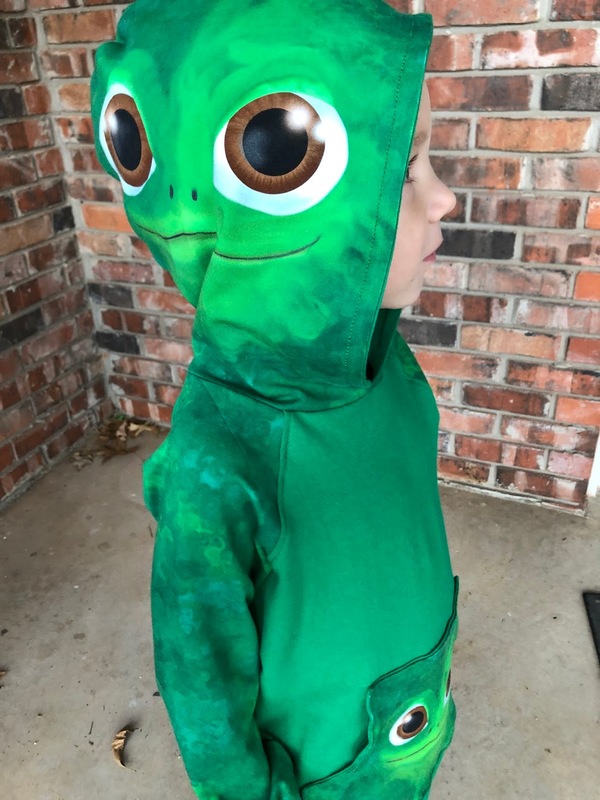 But I did achieve my main goal, which was a hood with Pascal on it. 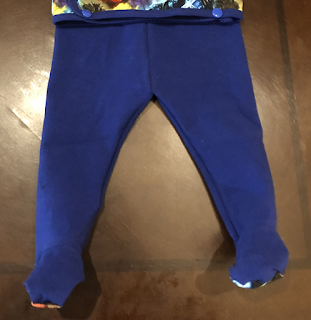 And in a stroke of luck by piecing my bottom band I was also able to squeeze out also a matching pocket, using a pattern piece borrowed from CKC Haven's Hoodie. I think it came together well! 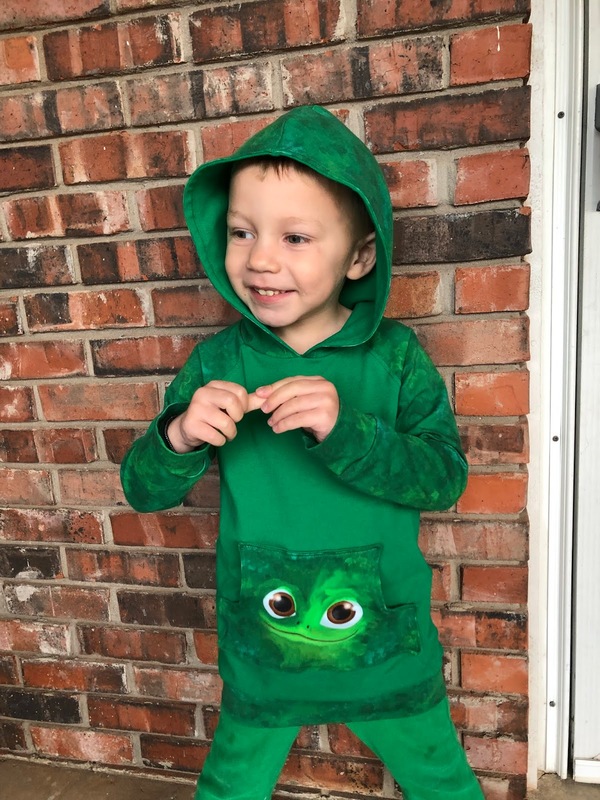 My son loves having a hood and some pockets, and I think he looks pretty sharp in that fabric selection. Post-assembly I kind of wonder if I made a mistake and cut the length for the non-banded version rather than the banded one, but kids sprout UP faster than they sprout OUT anyway, so I'm suspecting it will all work out in the end. And I'm feeling pretty good about flexing those fussycutting muscles, again. 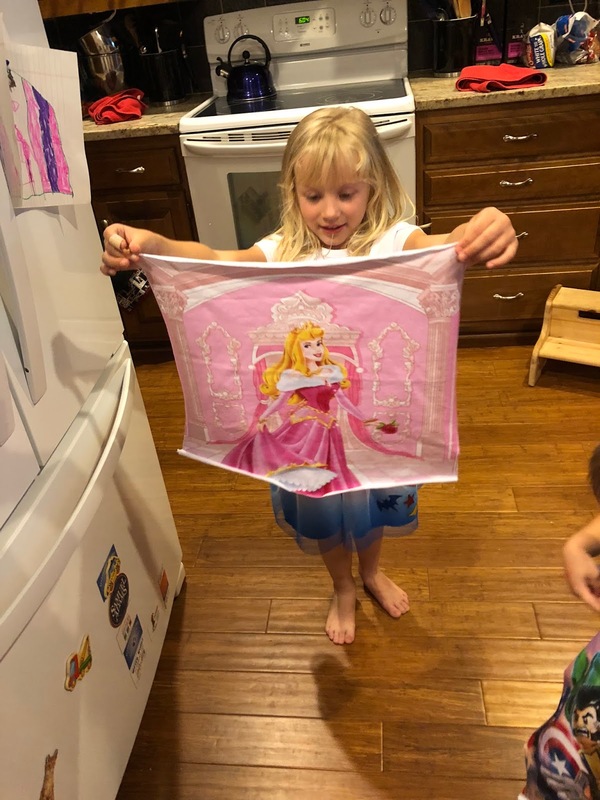 Nothing like a smile on my kiddo's face, and a gift that's proudly mom-made. Last January I made my daughter a much beloved Haven's Hoodie out of Descendants fabric. She's gotten tons of wear out of it, and actually converted several other kids to fans by making it a conversation piece. 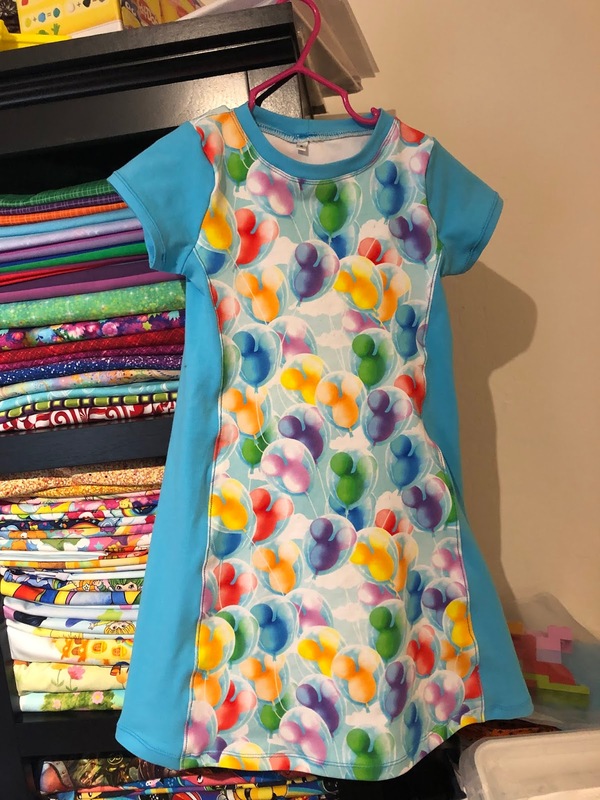 I've only made one other SLPCo Paisley, and ironically it was the Mario Dress for Z. But the Peplum look of the top fits with the aesthetic of Mal's jacket, and I know Z looks good with the distinctive cutout in the back. Since there's a similar cutout in Mal's coronation dress, I forged ahead. Z and A are of a size, so I got A to model the dress. 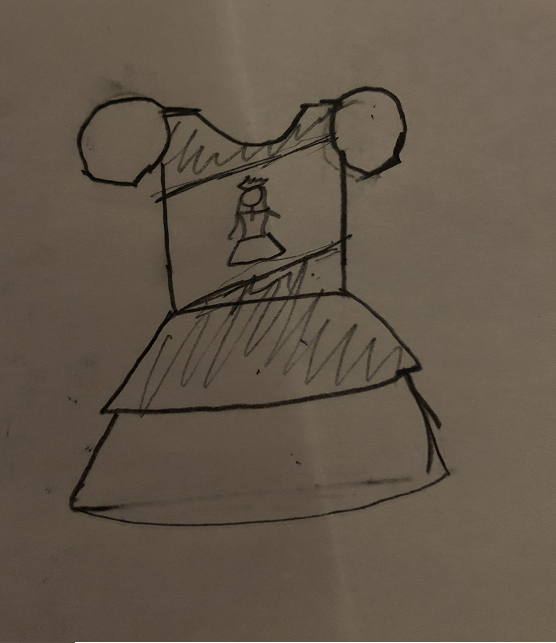 My plan is to also make a complimentary dress for A before July, so that the girls will each have an outfit ready if D3 catches on like D2 did. A's probably got a few more months of wear on her hoodie, and hopefully that'll give me time to come up with a third "original" design for a D3 dress. 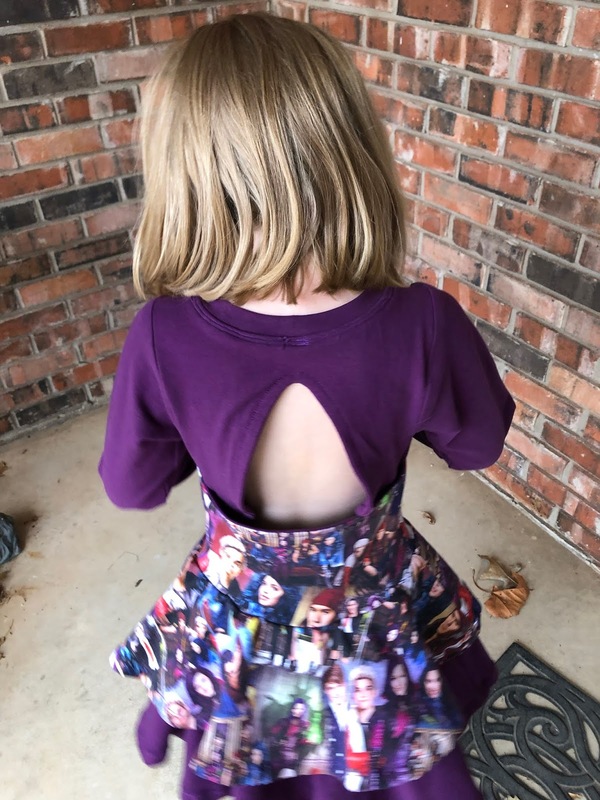 In the meantime, I'm pretty proud of this one, though: I modified the pattern by dropping the waist and adding a second circle skirt. It was supposed to be a tunic, but I kept adding length, and honestly, I think it still looks pretty cute as a dress. Z is definitely excited to have it, and I can't wait to get the two of them together in their matching dresses. They have a date for D3 in July, after all! And when I was done I had... less than a fat half of the main, but still enough to make another onesie. 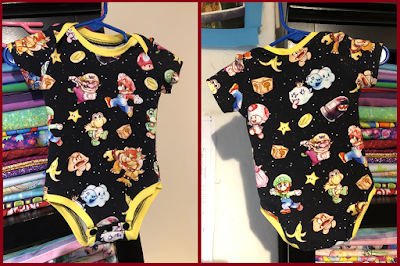 So, out came the Peekaboo Lullaby Line Bodysuit, just in time for Christmas. This time, I followed the instructions for the neckline properly (matching dots), and it made for a big improvement. 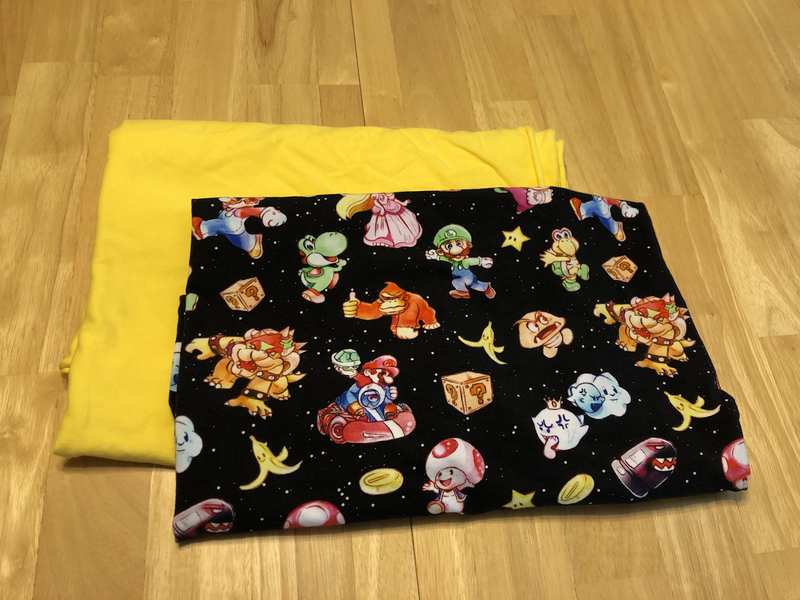 I also used my Serger to finish the seams on this one, which was slightly nervewracking but also a good learning experience. 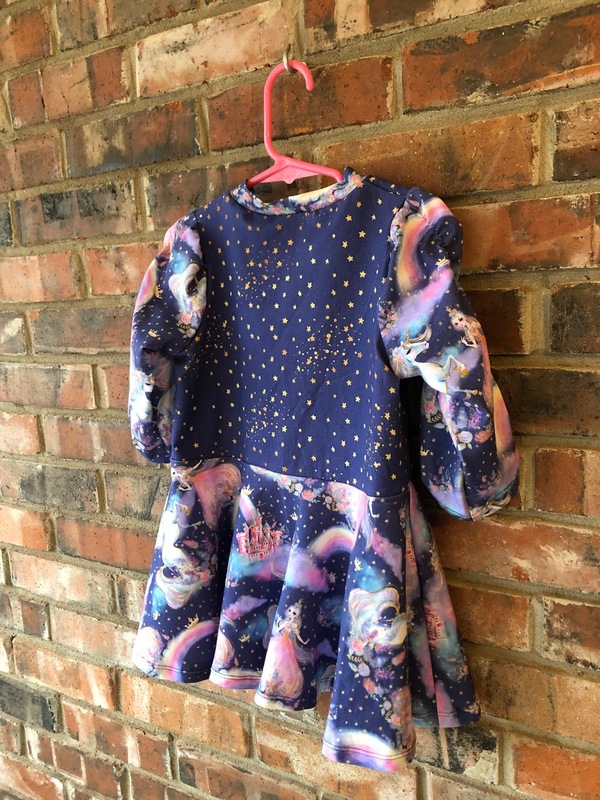 The serger really does add a professional-looking finish. 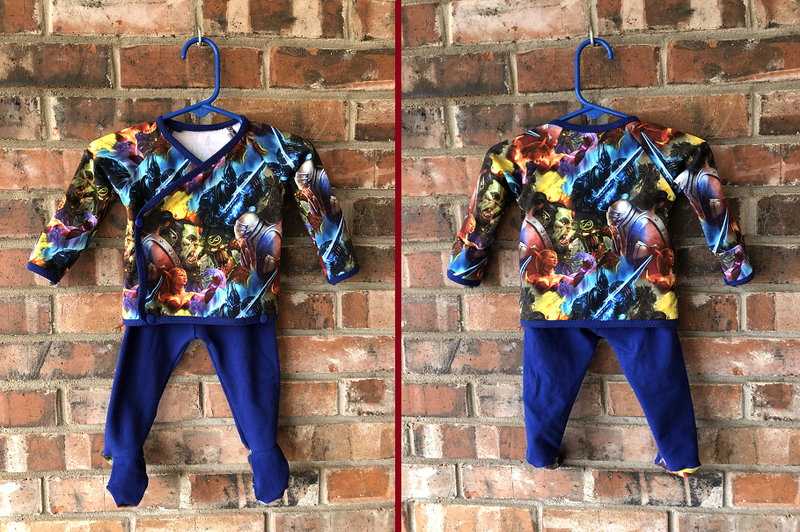 I didn't get a chance to take outside pictures of this Onesie, because it pretty much went directly from my sewing table to under the Christmas tree. But my SIL was thrilled to receive it, and at 6m size, it won't be too long before my yet-to-appear nephew can wear it! 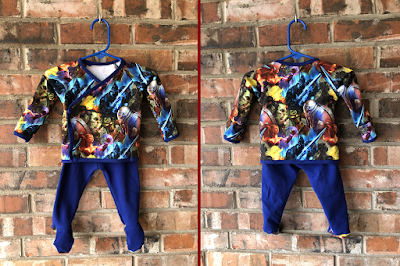 Engineer by day, Mom by night, and sewist on the occasional weekend. Good Friday and Pops Doing GREAT!